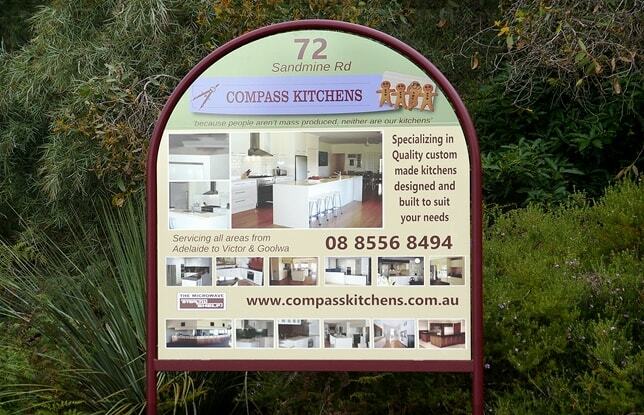 This Adelaide kitchen renovation is a perfect example of how flexible we are and what we can do when asked. 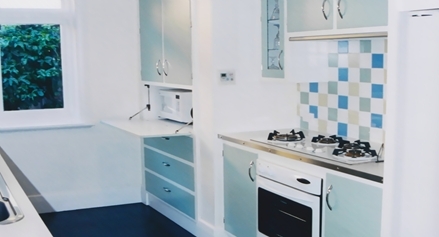 Our client's home at Cumberland Park was built in the early 1900s and therefore they wanted their new kitchen renovation and room extension to be sympathetic with their home's heritage. At the same time however, our client wanted a kitchen and living area that was more spacious, more family orientated, and one that still provided more of today's modern functional features commonly used in Kitchens, all of which provide easy care and maintenance, easy storage access and more enjoyment when working in the kitchen. We designed and built for our client this new Kitchen to an original cabinet style of the 1900's Deco Period; combining timber pilaster frame fronts and rebated doors in a painted finish, but inside it had modern white laminate surfaces that we sectioned into modules while also incorporating modern Full Extension drawer runner systems, fittings and Appliance units. 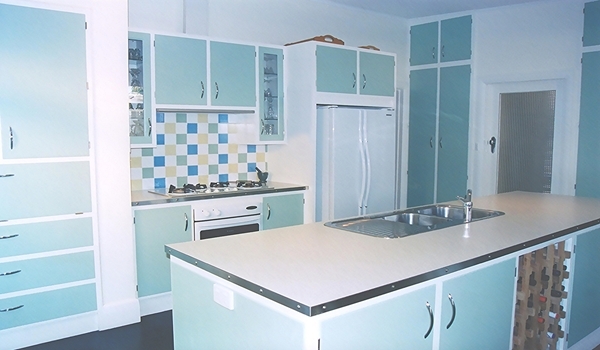 We designed and built for our client this new Kitchen to an original 1900's Deco style cabinets; combining timber pilaster frame fronts and rebated doors in a painted finish, but inside it had modern white laminate surfaces that we sectioned into modules while also incorporating modern Full Extension drawer runner systems, fittings and Appliance units. 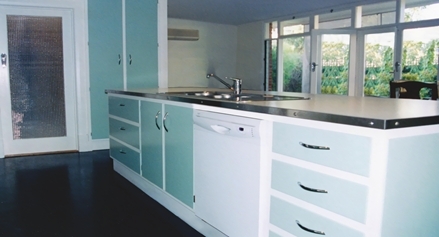 We also sourced a modern Benchtop Laminate by Abet that had an old Deco print design that was well in keeping with this kitchen's style and period feel. 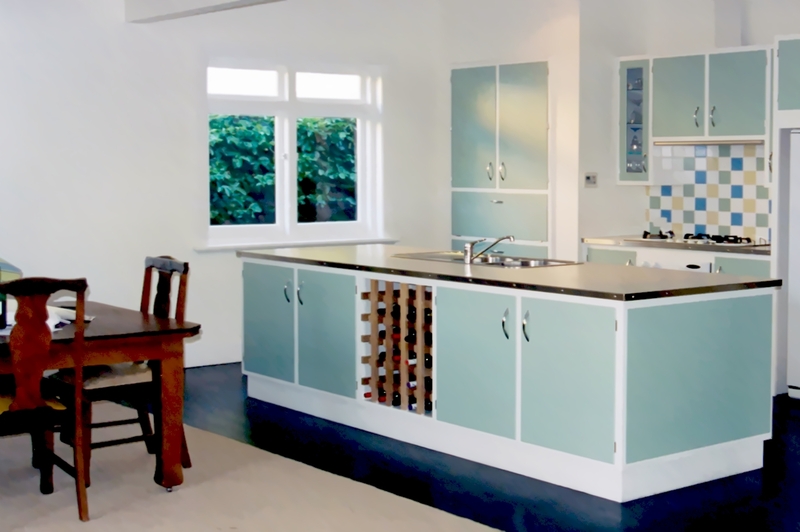 For this Kitchen we also incorporate Stainless Steel edged Benchtops with authentic cup-screws typical of the period, but all finishing under the top laminate for an easy-to-clean, smooth no-catch work surface. Here we also welded, ground and buffed the Stainless Steel Edged corners for a smart seamless finish. 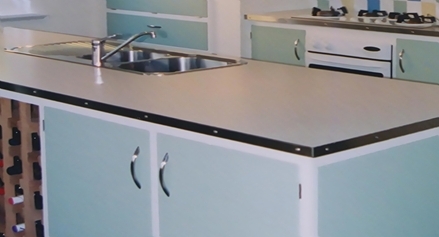 We incorporated an underbench oven, an inset cooktop and inset sink. 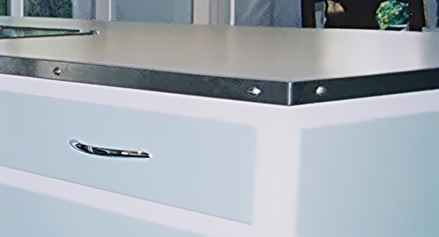 We included a built-in dishwasher, a retractable ducted rangehood, an enclosed refrigerator, wine racks, an appliance unit, Overhead glass door cabinets, 6 deep pot drawers and four cutlery drawers; all on quality European runners, then included a sliding two-tiered cutlery tray for even better organisation and storage. 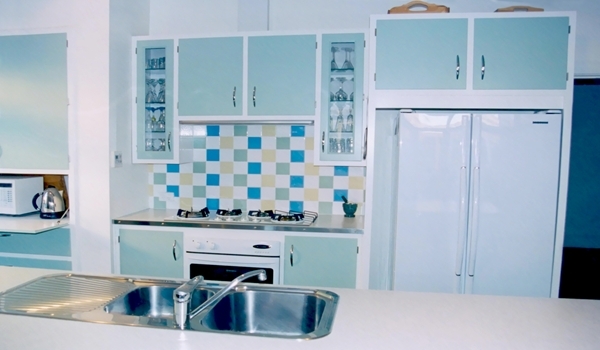 This combination of style, with modern fixtures and features has produced a very functional kitchen that is easy to care for and still looks very much at home in this lovely Deco period home at Cumberland Park, South Australia.